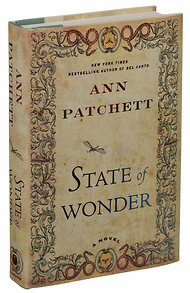 If you’ve ever dreamed of living in the Amazon with native tribes while researching fertility drugs–then “State of Wonder” by Ann Patchett is your book. Marina and her colleague, Anders, are researchers at a pharmaceutical lab. But when Anders travels to South America to check up on the researchers, he dies–and is buried in the jungle. Anders’ wife asks Marina to travels to Brazil to find out the details behind her husband’s death. Just a sidenote: I could NEVER travel down the Amazon River. Patchett’s description of the jungle and the creepy-crawlies, cannibals and giant snakes that live there will keep me safe in my home for the rest of my life. I probably won’t even go on Disneyland’s Jungle Adventure anymore. Patchett is an amazing writer. I really enjoyed “Bel Canto” but I think she outdid herself with “State of Wonder.” Interesting to read how everything changes once civilization is left behind. “A Visit From the Goon Squad” is the much-heralded, Pulitzer-prize winning book that was supposed to be the most amazing novel of the year. Granted, I’m not as smart as I should be, but none of the characters seemed likeable and I found myself endlessly frustrated with their behavior and choices. EXCEPTION: The Powerpoint chapter was fantastic and so well-crafted that I read it twice. But overall, a seemingly endless cast of characters filled the pages and I found myself going back frequently to figure out who was who. I get it. Everyone gets old. Youth is wasted on the young. People are never happy with what they have. Yadda, yadda, yadda.